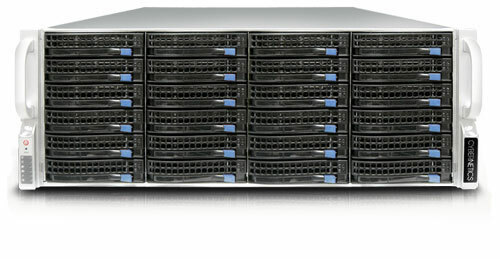 The iSAN® 6000 Series SAN storage models provide maximum performance and inherent reliability with redundant components. An even higher level of protection is available with hardware level real-time mirroring between two units with automatic failover, providing true no-single-point-of-failure. The iSAN® 6000 Series is loaded with onboard data protection features like snapshot backup, portable disk backup, tape backup and encrypted and deduplicated WAN replication. If your data storage needs grow, just add drives to dynamically expand capacity without downtime. Add lower-cost expansion arrays for scalability up to 192 drives and 1.5 PB of integral storage on a single SAN.